FTSI has received multiple reports of attempted ATM thefts. The incident shown in the security footage below was prevented due to security measures in place and resulted in ATM surface damage. Customers should be aware of the various types of thefts to ensure prevention against attacks. 1. Hooking an anchor to the ATM door with the other end hooked to a heavy-duty truck in an attempt to yank the door off. 2. Thieves are securing copies of the ATM top hatch keys. 3. Technicians being robbed while conducting maintenance operations to the ATMs. The security measures taken to prevent theft above were successful against cash being stolen, with the use of live video monitoring and a warning alarm to notify the criminals police were called to the scene. 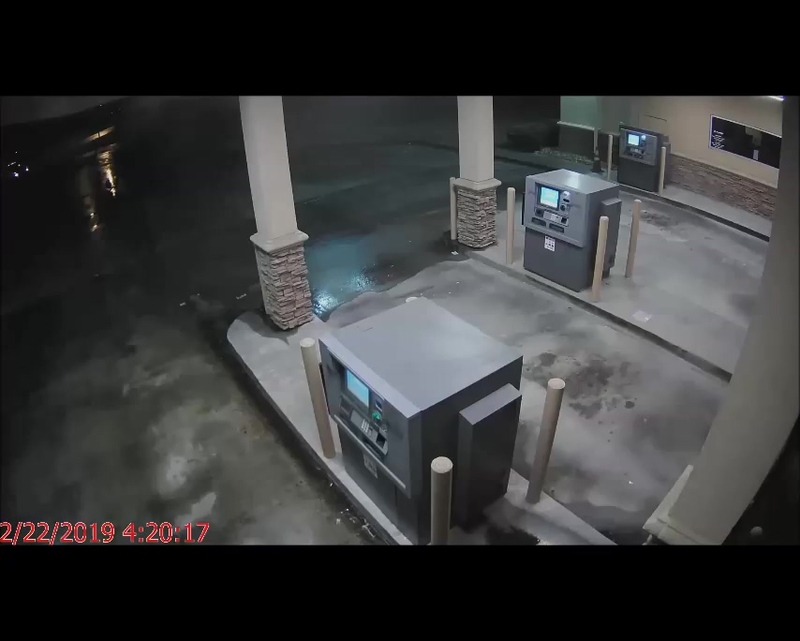 Security personnel monitoring the live feed were able to trigger the alarm and notify police and branch management as soon as the criminals began tampering with the ATM, which eventually caused the thieves to abandon their efforts and drive away. Police arrived on scene within 5 to 15 minutes once they had been notified of the incident. During this incident, money was not stolen from the ATM safe, however the ATM was damaged and had to be replaced. FTSI recommends reevaluating security measures that are in place at your ATMs to prevent any type of potential theft. 1. Installing a barrier gate in front of ATM that can prevent thieves from trying to yank the ATM out of its place. 2. Video surveillance with remote, live viewing and 24/7 alarm monitoring. 3. Change the top hatch keys to a secured, personalized set of keys to eliminate chances of keys being copied by criminals. 4. Make sure your ATMs are equipped with an audible alarm that is triggered when the top hatch is open and alarms police and bank management. 5. Check to make sure your ATMs are equipped with vibration systems that will trip the audible alarm when any disturbance of the ATM is detected. During installation of a vibration sensor FTSI can install at the bottom of the ATM near the safe door, which is the most common place for thieves to attack first. 6. Enhanced lighting around the building and ATMs with warning signs posted of live security monitoring 24/7. 7. Typical ATM anchoring bolts may fail due to the attack energy forcing the base concrete to shatter. Consider a different type of anchoring technology that is designed to absorb and redirect any attacking force to prevent ATM removal by brute force impact. Contact us at solutions@ftsius.com to learn more about adding extra security to your ATM fleet.